Nahash the Ammonite marched north to besieg the Hebrew city of Jabesh Gilead. The men of Jabesh said to him, "Make a treaty with us, and we will be subject to you." But Nahash the Ammonite replied, "I will make a treaty with you only on the condition that I gouge out the right eye of every one of you, and so bring disgrace on all Israel." The elders of Jabesh said to him, "Give us seven days so we can send messengers throughout Israel; if no one comes to rescue us, we will surrender to you." When the messengers came to Gibeah (where Saul lived) and reported these terms to the people, they all wept aloud. Just then Saul was returning from the fields, behind his oxen, and he asked, "What is wrong with the people? Why are they weeping?" Then they repeated to him what the men of Jabesh had said. When Saul heard their words, the Spirit of God came upon him in power, and he burned with anger. He took a pair of oxen, cut them into pieces, and sent the pieces by messengers throughout Israel, proclaiming, "This is what will be done to the oxen of anyone who does not follow Saul and Samuel." Then the terror of the LORD fell on the people, and they turned out as one man. When Saul mustered them at Bezek, the men of Israel numbered three hundred thousand and the men of Judah thirty thousand. They told the messengers who had come, "Say to the men of Jabesh Gilead, 'By the time the sun is hot tomorrow, you will be delivered.' " When the messengers went and reported this to the men of Jabesh, they were elated. They said to the Ammonites, "Tomorrow we will surrender to you, and you can do to us as you will." The next day Saul separated his men into three divisions; during the last watch of the night they broke into the camp of the Ammonites and slaughtered them until the heat of the day. Those who survived were scattered, so that no two of them were left together. Saul's anointment as king of Israel has meant little to this point. Many of the people have not accepted him, and he certainly hasn't rated any sort of kingly accoutraments — he is plowing his field with a team of oxen when news of the Ammonite attack reaches him. At this time, Jabesh Gilead was a city in the middle of nowhere, far east of the Jordon and fifty or so miles northeast of present-day Jerusalem. Jerusalem itself was, at best, a little farming village; Saul lived in Gibeah, a town just to the north of it. The small southern Hebrew territories where Gibeah and Jerusalem are located were already called "Judah" (which the Romans called "Judea"). As can be seen on a map of the time, the Ammonites lived directly east of Judah; the Hebrews were squeezed between them and the Philistines, a sea-people, to the west. 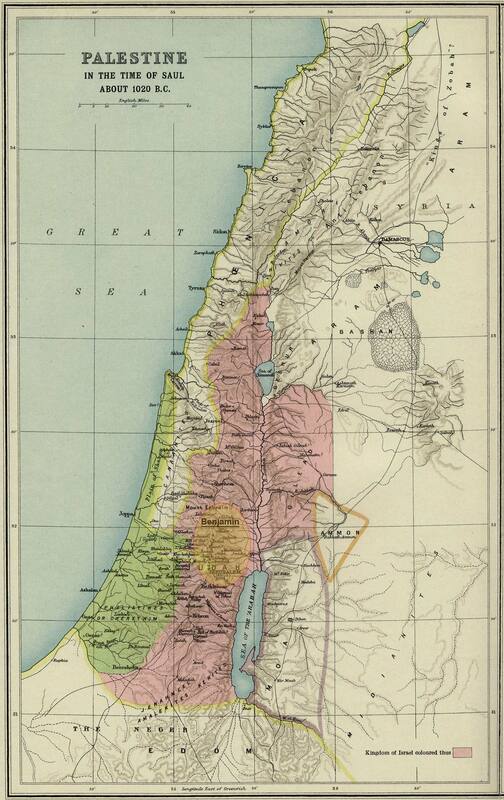 Map of Palestine at the Time of Saul. In today's reading, Saul vigorously and successfully takes up the role of king for the first time. He shows the leadership to rouse the entire Hebrew population. He musters and leads an army of 330,000 men to the besieged city and utterly routs the Ammonite invaders. A nation has been born.